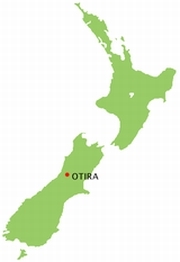 Otira is a small township seven kilometres north of Arthur's Pass in the central South Island of New Zealand. It is on the western approach to the pass, a saddle between the Otira and Bealey Rivers high in the Southern Alps. It was originally a stop on the Cobb and Co stagecoach from Canterbury to the West Coast. 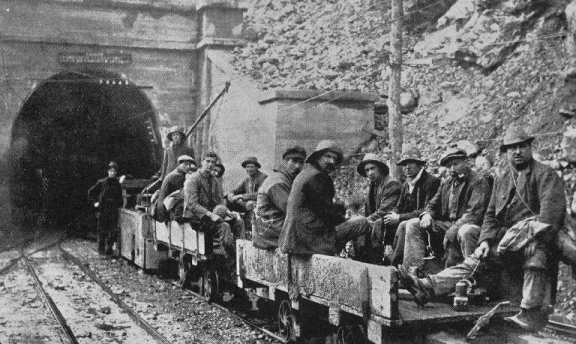 The railway line was then built from Greymouth to Otira, with the pass navigated by coach, until the railway tunnel opened in 1923. The township is principally old Railways housing, much of which was constructed in Hamilton and shipped south to be reassembled on site. Close to the town are two major feats of civil engineering: the Otira Tunnel, and the Otira Viaduct. The Otira Tunnel is a railway tunnel on the Midland Line in the South Island of New Zealand between Otira and Arthur's Pass. It runs under the Southern Alps from Arthur's Pass to Otira - a length of a little over 8.5 kilometres (5.3 mi). 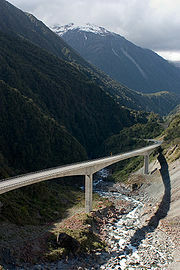 The gradient is mainly 1 in 33, and the Otira end of the tunnel is over 250 m (820 ft) lower than the Arthur's Pass end. Construction started in 1907 and it opened on August 4, 1923; at the time of its construction, it was one of the longest tunnels in the world. Because of its length and gradient, gases such as carbon dioxide and carbon monoxide could easily build up, potentially making the tunnel both unhealthy for the train's occupants and unworkable with steam engines. Thus, the tunnel was electrified with a 1500 V DC overhead system. A small hydroelectric power station was built near Otira to provide electricity. The locomotives used were the EO class, then from 1968 the EA class. Due to the increasing age of the electrification and the availability of upgraded DX Class diesel locomotives, the electrification was disused in 1997 and the equipment removed. This marked the end of electrification in the South Island. To overcome the fume problem, a combination of a door and fans is used. After a train enters the tunnel from the Otira end the door closes off the entrance, and a large fan extracts the fumes behind the train. Once the fumes have been extracted, the door is reopened. Because of the fumes, the TranzAlpine's observation cars are closed for the trip through the tunnel. Above the town is the Otira Viaduct. Completed in 1999, it spans a 440-metre stretch of unstable land, replacing a narrow, winding, dangerous road that was prone to avalanches, slips and closures. The viaduct can be fairly called an example of engineering genius, owing to the challenging combination of a highly unstable foundation, flash flooding, steep slope, erosive factors, and lack of any stable site to base construction work. The fact that the viaduct was completed for 45 million New Zealand dollars in less than two years of work is nothing short of incredible. Otira Gorge is a very steep, scenicly amazing gorge on the western side of the Southern Alps, between Kumara Junction and Arthur's Pass.